A brief “vacation” last year was spent zipping around Israel to see bits I hadn’t seen during my first trip in 2014. The main population centers of Tel Aviv and Jerusalem are in the dead center middle of the country. So, if one’s time there is a little over a week, given how physically long it is, you basically need to go to the north or to the south. I find deserts fascinating as long as you have air conditioning and so south it was, passing all the way down to the Red Sea and the town there called Eilat which is a curious place essentially thrust into the red, hot rock that plunges into the amazingly cold waters of the sea. It must be noted that to swim in said water requires either paying to enter a private beach or hopping through a hole in the fence near the border control with Egypt. Again, curious place. Returning north, a stop off in Mitzpe Ramon posed the need to visit a gleaming vinous oasis just north of the town. Vineyards in a desert are still generally pretty novel. 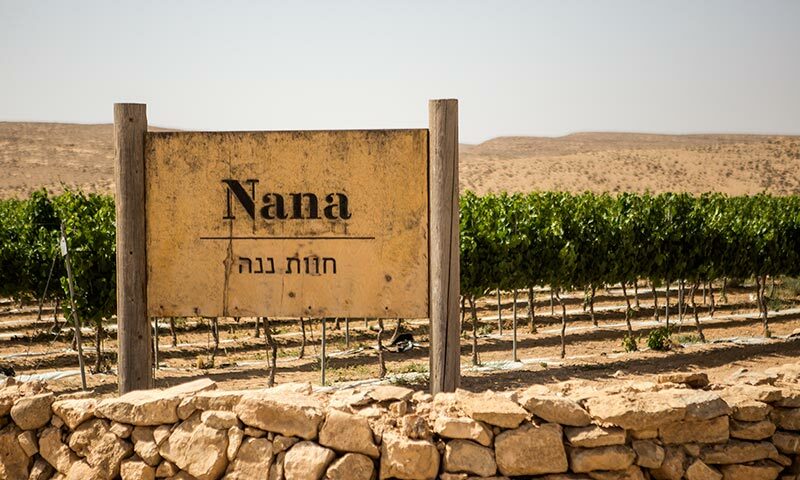 While there are other projects around the Negev and some of them produce okay wines, what makes the vineyards around Mitzpe Ramon special is that there is an ungodly, evening wind that drops the temperature some 20C, making much more nuanced wines. I’m still stunned by the level of acidity found in the resulting wines. This visit culminated in writing an article I’m quite happy with for the latest edition of World of Fine Wine as I think it captures my amazement of how unique the region is. Far and away I think that Nana is making some of the best expressions of the region, but Midbar isn’t far behind. And while all growers are still playing around with different varieties, ducks do seem to be coming into a row. There aren’t however any tasting notes in that article as coordinating samples was like trying to juggle fire-breathing, drunken cats and so what I ended up with, I present below for any and all’s enjoyment. Dark ruby with just a minor garnet crest. Red cherry and ripe raspberry, touch of plum, graphite and pencil shavings, light bell pepper notes, overall crunchy red fruit aspect. Red fruit dominant on the palate. Very tart fruit aspect, medium plus, nearly high acidity, lean tannins and medium plus length to the finish. Very much a warm weather Cab but without having that big, bassy fruit found in others. Pale lemon color, bright, moderate intensity. Zesty lemon pith, green apple, bit of plump ripe peach, limestone mineral note, leafy sage and fennel, light yellow flower notes. Dry, medium acidity, medium alcohol, dried apricot notes on the palate, medium finish. Light peach, dried apricot, delicate lemon pith, candied lime. Lime notes more prevalent on the palate, medium plus acidity, medium length, bitter almond in the finish. Ruby color, light rim, garnet aspect. Crisp red cherry, young plum, bit of garrigue, old wood, and dusty mineral notes, sage, red licorice. Red fruit on the palate, plump strawberry, touch confected, probably small amount of RS, minor tannins, medium minus acidity, medium alcohol, medium plus persistence. Lingering red fruit on the palate. Muted red cherry with a touch of raspberry, black licorice, sage, touch of saddle leather, and some plump boysenberry at the bottom. Medium acidity, mix of fruits verging more dark on the palate, light wood notes and integrating tannins, very nice length.